Today I tackled something familiar yet new. Familiar, because I have cooked it before, under the watchful eye of my mother, but new because I had not cooked it myself or in this manner. The meat? Salmon. I'm not sure of the variety, because it was a gift of one of our parishioners- but it was fresh caught! I was very excited about the prospect of eating salmon, though slightly daunted, but my husband was not. He is not a huge fan of fish in general, so I haven't really been motivated to cook any thus far. But, as it was a gift, and as I love the beautiful pink fish, I was determined to have a go at it. I have had the salmon thawing in my fridge for the last few days, and today I knew it would have to be done. Cooking it didn't scare me too much, it was the prospect of preparing it that was getting to me. Problem #1: I know what a "ready-to-cook" fillet looks like and this fish did not look like that. It was whole (save for head and tail and thankfully had been gutted), complete with skin and fins. FINS! Even now I shudder. Yuck! So, I searched all over the internet for instructions on how to fillet a whole salmon. Finally I found very detailed, very simple directions (with pictures!) on a fly fishing website! This did not look like it was going to be a pleasant task. I have no "fillet knife" but my "slicing" knife worked just fine. Aided by a towel and grimacing quite frequently, I sliced my fish into acceptable fillets. Having no needle nose pliers at hand, I plucked the remaining bones free with the tips of my kitchen scissors. I was so relieved when the fish began to look familiar. Tucking the salmon back into the fridge till dinner time, I thoroughly cleansed my hands of slime and scales and went on with my other morning tasks. Later in the afternoon, armed with my Betty Crocker Cookbook, I mixed up a recipe for a Honey-Mustard Glaze for my salmon, which was to be broiled. While the fish swam in it's yummy looking marinade, I double-checked the recipe and ran headlong into Problem #2: a broiler pan. I don't have a broiler pan. So, again, Google was my savior. I found from reading several online recipe chats that a broiler pan can be easily substituted with a cooling rack perched on top of a sided baking sheet. Whew! Those I have! That problem solved, I transferred the salmon to the greased cooling rack (which was now posing convincingly as a broiler rack). My husband walked through the door and sniffed appreciatively. As we sat down to dinner, I watched him as he tried it..."Wow," he said, "this is really good!" It did taste superb, if I do say so myself, and it was such a wonderful treat! The fish was a pleasing light pink, and perfectly moist. The glaze had formed into somewhat of a crust under the broiler and the blend of flavors in it were a lovely complement to the mellow flavor of the fish. 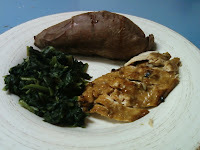 I paired it with baked yams and steamed spinach, which made for a meal of pretty colors! When, after several minutes, my husband helped himself to a large second serving, and when, by the end of our meal (and despite the accusing glares from my goldfish) we had nearly consumed both large fillets, I considered my fish foray a success! 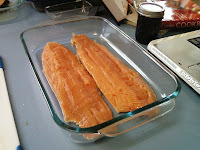 2) Place salmon, skin side down, in shallow glass or plastic dish. Pour marinade over salmon. Cover and refrigerate at least 15 min, but no longer than an hour. 3) Set oven control to broil. 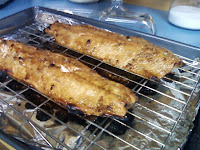 Remove salmon from marinade; reserve marinade. 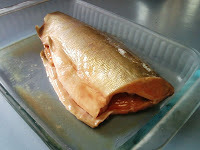 Place salmon, skin side down, on rack in broiler pan. Broil with top 4-6 in. from medium heat 10-15 min, brushing 2 or 3 times with marinade, until salmon flakes easily with fork. Discard any remaining marinade. Well it looks like you did a good job. I know my mom has filleted many a fish, but I never took the time to watch her, Darn it- thank goodness for google!